As a regional leader in advanced care for heart failure, the Seton Heart Institute offers you convenient access to top quality, comprehensive cardiovascular care close to home. an appointment with a cardiologist near you. 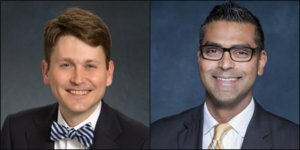 Raymond E Bietry, MD and Thomas “Bobby” Kurian, MD recently joined Seton Heart Institute and are accepting new patients. Dr. Bietry completed his residency at Mount Sinai Medical Center in New York, and is board certified by the American Board of Internal Medicine in Cardiovascular Disease as well as Heart Failure and Transplant Cardiology. Dr. Kurian went to medical school at UT Southwestern, where he also completed his residency. He is board certified by the American College of Cardiology in Cardiac Electrophysiology.